State lawmakers, faced with a transformed energy landscape and a glut of renewable power as California charges into a greener future, are considering a handful of measures to meet the state’s energy challenges. The puzzle: how to align state policies with the quickly-evolving electricity world, one lawmakers are attempting to define and to decide how to regulate. Key questions include who should be allowed to distribute energy and whether to expand consumers’ choices in purchasing electricity. The debate is taking place as the summer heat has been unleashed, when demand for power rises in concert with temperatures. At issue are the reliability and resiliency of the power grid—its ability to supply electricity consistently and balance itself when unexpected demand or supply arises. One of the most sweeping and controversial ideas, presented as a way for California to produce and use electricity more efficiently, is chilling to some: the replacement of California’s own grid operator with a new regional authority to manage power for the entire West. The question is whether California would be giving up too much for too little. The proposal, from Assemblyman Chris Holden, a Pasadena Democrat, would open a market for California’s solar power but could also loosen the state’s grip on some distribution decisions. It has been percolating for several years in one form or another and has been, to say the least, hotly debated in Sacramento. Yes, California’s Independent System Operator in its present form would disappear. But a multi-state power authority run by a board of representatives from each participating state would operate more efficiently, better harness renewable energy and expand the state’s climate policies to its neighbors, some supporters say. There are already many masters in the existing energy distribution system dispatching power west of the Rockies. On the top of that food chain is the Federal Energy Regulatory Commission, which oversees interstate power transmission. But opponents say that California would be handing over critical decision-making power to states peddling fossil-fueled energy. They say Rocky Mountain coal states could send more dirty power to California, if they elected to participate. Even though California has policies requiring utilities to buy a certain amount of renewable power, it can be difficult to determine how each watt of power coming into the state was generated. A unified grid would provide needed transparency, supporters say. Opponents counter that the proposal would saddle California consumers with unfair costs for new transmission lines and other infrastructure outside the state. That’s one reason some labor groups oppose the bill; they’ve estimated that tens of thousands of construction jobs will be lost to other states. Matthew Freedman, an attorney with The Utility Reform Network, a watchdog group, applauds improvements to the transmission system. But, echoing critics who say more vetting is needed, he expressed concern that the Holden bill would be a precipitous step. The proposal has long held the interest of Gov. Brown and carries his considerable political weight behind it. Other proposals in the mix include allowing industrial and commercial energy customers to cut the cord that binds them to major utilities, as well as a bid to help California reach its climate goals by fashioning a fully “clean” power supply by 2045. California is at the forefront of the budding consumer choice movement—ratepayers leaving behind fortress-like utilities and grouping together to buy power from alternate providers. It’s caught on in more than a dozen California cities and counties, where local governments now determine their own power mix. One bill the Legislature is considering would allow commercial and industrial power customers to join the “community choice” movement, unplugging from utilities. 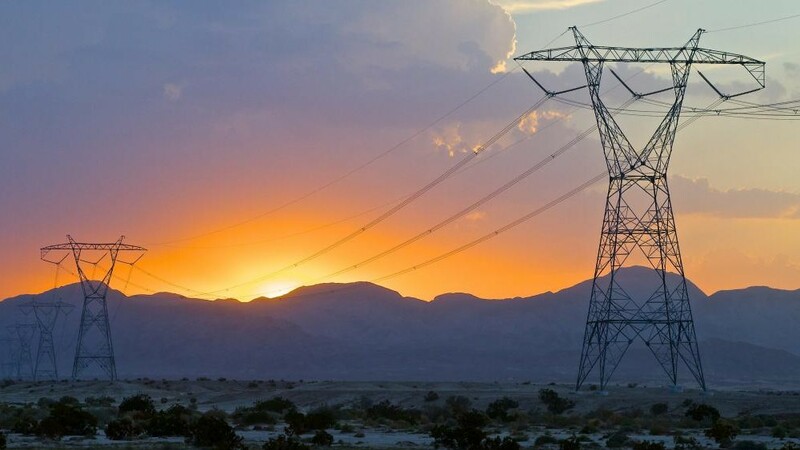 The freedom of choice would encourage competition among power providers and drive down prices, said the bill’s author, Sen. Robert Hertzberg, a Democrat from Van Nuys. The highly technical proposal has flown somewhat under the radar, and its prospects for passage are unclear. The state Public Utilities Commission has already weighed in on the idea of community grids and other ad hoc arrangements. It warns in a draft report that they could leave consumers vulnerable to fly-by-night operators, stranded without power. In an interview with CALmatters, commission President Michael Picker invoked the price spikes and blackouts that rolled across California during the energy crisis of 2000 after deregulation of the energy market. 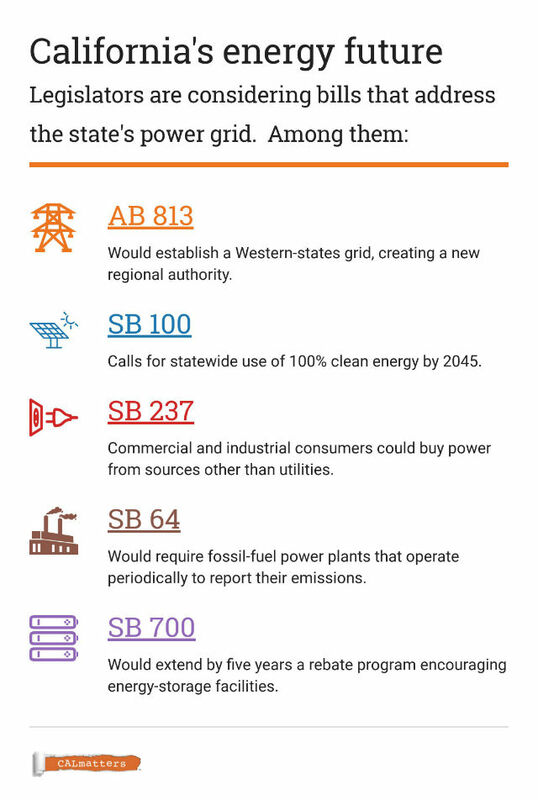 Among the other ideas that will be on lawmakers’ agenda when they return from recess next month is one that failed last year and has a second chance now: Sen. Kevin de Leon’s proposal that California use 100 percent clean power within the next 27 years. The Los Angeles Democrat maintains that the state is on track to meet this accelerated goal. But his legislation is opposed by such powerful interests as the California Chamber of Commerce and the state’s three largest utilities. Legislative politics, which stymied the bill’s passage in the last session, appear to be at work again, making its prospects somewhat murky now.